The internet is full of spurious quotes. Who knows what percentage of the quotes on Twitter and Facebook are not real, or not really from the person to whom they are attributed? The more prominent a historical figure is, the more bogus quotes are attributed to them. I once wrote a column for the Huffington Post just on the bogus quotes attributed to Patrick Henry. The problem of inauthentic quotes is hardly unique to Christian culture, but it is a serious issue. We of all people should prize factual accuracy, but unfortunately bogus quotes are a staple of popular Christian books (including ones by Christian history writers), sermons, and tweets. The next time you see a quote you’re tempted to use, there is a quick way to check its authenticity. To take an example from my Twitter timeline, I came across a Carl Henry quote that says, “A Christianity without a passion to turn the world upside down is not reflective of apostolic Christianity.” To check it, I copy and paste it into Google Books (not a general Google search). I instantly get several hits on the quote from Henry’s The Uneasy Conscience of Modern Fundamentalism and from scholarly books related to Henry (that is, books published by academic presses). This tells me with 100 percent certainty that the quote is authentic. Tweet away. Here’s a more problematic example: “Other men may preach the gospel better than I, but no man can preach a better gospel.” This quote is cited constantly on social media and attributed to George Whitefield. But a Google Books search (putting the quote in quotation marks) does not give me any direct hits in which the text preview for the book shows the actual quote. The results show books related to the topic, but no strong leads related to the quote itself. 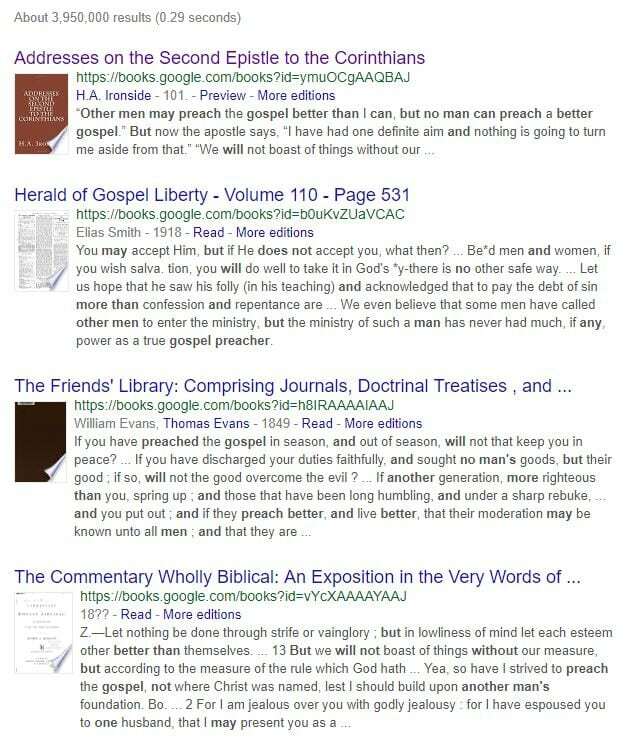 When I search on Google Books with no quotation marks (see image), I do get one direct hit—from a Bible commentary by H. A. Ironside. Not a good sign, because one would expect a legitimate quote to appear either in a sourcebook of Whitefield’s papers, or a scholarly book about Whitefield, not just in a book having nothing in particular to do with Whitefield. I don’t know if this is the original source of the quote, but this is enough to tell me that attributing the quote to Whitefield is at least questionable. If you care about this sort of thing you’re welcome to keep digging to try to determine if Spurgeon really is the original source, and how Ironside came to attribute it to Whitefield. You may not be able to determine answers to questions like that with 100 percent confidence. But in most cases you probably don’t need to do that extra work. You can just note the quote as “unconfirmed” and move on, taking it out of your sermon or blog post. Does this all matter? One could certainly imagine Whitefield having said something like the quote above, and it will not do any major damage to cite it. But Christians should ideally have a reputation for intellectual precision and integrity, and circulating misattributed or bogus quotes does not build up that reputation. Sign up here for the Thomas S. Kidd newsletter. It delivers weekly unique content only to subscribers.